The Hip & Urban Girl's Guide: Cookie Tasting At The Coach House Shortbread Co.
Cookie Tasting At The Coach House Shortbread Co.
With the holiday season fast approaching, it’s time to turn your mind to gifts, parties, and...shortbread! Because it just wouldn’t be the holidays without these tasty treats, right? I could smell butter and sugar wafting from the Coach House Shortbread Company’s Tasting Event before I even hung up my coat. I couldn’t wait to sample the award-winning line of sweet and savoury shortbread. Owner and baker Carl Stryg got started in the biz by experimenting with an old family recipe. He created a series of sweet and savoury shortbreads like no other. At first, his treats were gifts for family and friends. 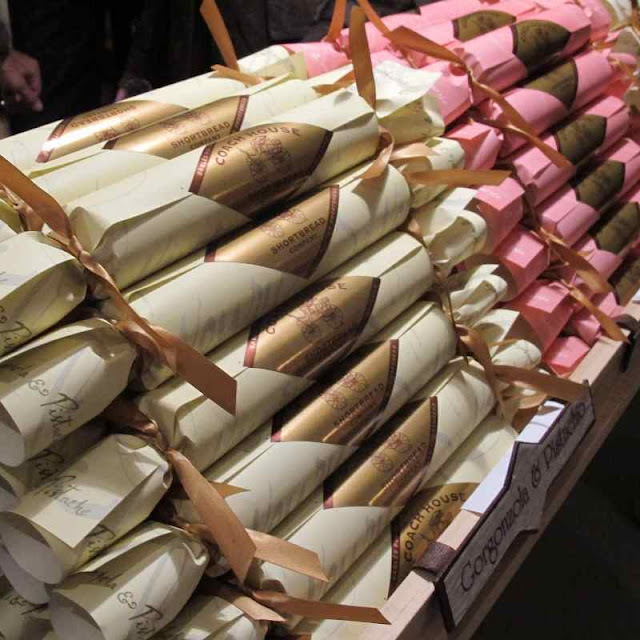 But soon, New York City stores were selling his shortbread, and now, the Coach House’s cookies are available across Canada. This shortbread is nothing like the packaged cookies sold in the stores. Each shortbread has an intense flavour that crumbles on your tongue – as if fresh out of the oven. No “cookie-cutter” shortbread here! 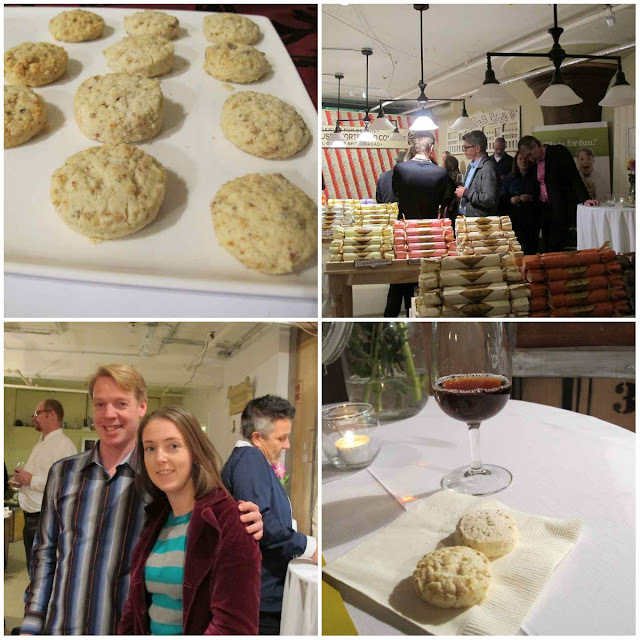 Try pairing the Cheddar & Chipotle shortbread with Calera’s Thirty-Fifth Anniversary Vintage Chardonnay ($24.95). The wine’s lemony tang complements the smoky chipotle and sharp-aged cheddar shortbread to a tee. Beware of this combo of Gorgonzola and Pistachio and 2009 Chapel Hill Shiraz ($25.95). The fusion of pistachio, lemon, and cayenne pepper with dark berry wine may leave you gobsmacked. I finished off the tasting series with the Walnut and Bella Vitano, paired with Graham’s 20-Year Old Tawny Port ($36.96). Baked with an artisan cheese soaked in raspberry tart ale, this shortbread delivers hints of orange zest and caramelized onion. A glass of port brings out the fruity flavours in the shortbread – nothing short of fabulous. 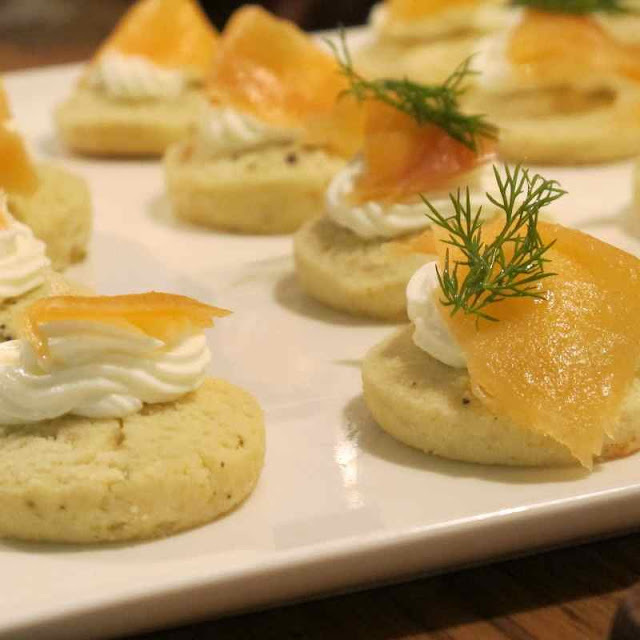 The savoury shortbreads are perfect as appetizers. Serve up the Stilton & Rosemary shortbread topped with marmalade jam or smoked salmon, and your friends will dub you a culinary genius. I loved how the shortbread was beautifully packaged and ready for holiday gifting. Each set is priced at $12.95 and contains about 18 biscuits. The Coach House Shortbread Company will be at the One of Kind Show in Toronto (Nov 22 – Dec 2). The store is located on the east side of Carlaw between Dundas & Queen St, or you can place your order online. Purchases can also be made at Dinah’s Cupboard in Yorkville. Wow! I had no idea about this great shop that is so close to home! I will definitely stopping by their booth at the One of a Kind Show too. Thanks for the tip! P.S: You were just lovely. Hey Ladies! it's that time of year again and I'd love to invite you back! Just email me at carlstryg@shortbread.ca for an invite.